For those who, like myself when I got to review this, don’t know anything about Dobble let me explain the incredibly complex rules: you see two cards, and have to find which picture appears on both. Yep, that’s it. Simple? Yes. Easy? No. Fun? Definitely. The cards themselves, which come in a great round tin to keep all 55 of them safe, have eight pictures on. By some impressive mathematical magic every card has only one picture in common with any other that you might pick out, and that very fact forms the basis of the game throughout its numerous and varied playing styles. Standard Dobble rules (a copy of which is included in the box) let between 2 and 8 players try out several different games, but the essence remains the same: cards get turned over and there’s a huge scramble to see who can find which picture appears on both cards. It’s far harder than it sounds, and considering there are only eight pictures on each card there’s an amazing amount of panic buzzing round the table while players desperately try and work it out. That’s the standard version of Dobble in a nutshell. The new Chrono addition not only adds a timer, but with it new ways to play including some single player variants. As if the panic against other players wasn’t enough, seeing the timer ticking down while you try to beat either your own or someone else’s score is every bit as nerve shredding. You can even record your scores in the rules booklet using the pencil included in the box, but with only a few spaces you’ll more than likely be playing long after you’ve filled in all of the gaps provided. And if, like me, you’ve got some little people around who want to try out your new game soul be pleased to know that this most definitely passes our regular Three Year Old Test. In fact, he was unnervingly good at the game, spotting pairs of images far more than either of his parents could manage. You might not get a lot of games out of someone that young, but this is most definitely a game you can play with younger gamers. So while Dobble Chrono is an excellent family game, I’m not sure it warrants a purchase if you’ve already got a vanilla version of Dobble already in your collection. Adding a timer and some new game modes is great, but a little bit of imagination and the stopwatch app on your phone will do pretty much the same job. 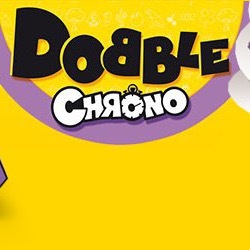 If you don’t already own Dobble then this version should be your go-to game to buy, but if you’ve already got it then I’d advise against it, or at least wait to see how the upcoming Cars and Star Wars versions mix things up a bit.